Sladen Portraits: Artist Duncan Gutteridge -- well known for his many celebrity portraits including stars of Star Trek, Buffy and other SF shows -- has created a new art print featuring Elisabeth Sladen (Sarah Jane Smith). Sanctioned by Sladen, the print is limited to 100 copies signed by both the actress and the artist. More information is available at www.duncangutteridge.com. Win A Dalek! : The online store BOL has launched a new science fiction section on their site, and as part of this they are running a competition to win a full size Dalek, supplied by This Planet Earth. The competition runs until 29 April. SF:UK Special: SF:UK, a Channel Four documentary series in Britain that features behind-the-scenes information on various science fiction and genre programs, will feature an entire episode devoted to Doctor Who on April 14. Some parts of the broadcast were filmed on location at the Llangollen Dr Who Exhibition in Wales. More details as available. Porcelain Figures: Classic Sheercast have issued the first in a BBC licensed series of limited edition porcelain figures - William Hartnell as the Doctor. All seven BBC Doctors will eventually join the range. There's a website for more information at http://www.doctorwhofigures.co.uk. They've also got a limited edition set of busts out as well, go to http://www.doctorwhofigures.co.uk/busts.html for those. Dalek Empire: At last, long-rumored "Dalek Empire" audio plans from Big Finish appear to be true. Four new Dalek Empire audio plays are set to be released next year. Although linking into this year's three Dalek adventures these new plays "will be completely Doctorless and promise to evoke some of the spirit of the fondly remembered Dalek annuals and strips of the Sixties and Seventies." Nicholas Briggs will be directing and writing all four plays "so expect them all to be closely linked with many of the same characters appearing in each story." The new Dalek Empire plays will be released in June, July, October and November 2001. Layton's Mission: A new audio production starring Anneke Wills (Polly), Michael Wade and Bryonie Pritchard, "Layton's Mission" is a science fiction story with intrigue and suspense. For more information, visit www.whap.fsbusiness.co.uk. Travelwise: Now available on video in the UK (PAL format only), "Travelwise" features five Doctor Who celebrities among many other well-known faces. This four-part educational drama is "aimed at secondary schools and provoking many debates, and deals with the many issues around our methods of travelling." Colin Baker (as Jonathan Pike), Nicholas Courtney (as Alistair Singleton), Nicola Bryant (Laura), Sarah Sutton (Sharon Singleton) and Peter Miles (Mr. Reise) star. (It is especially noteworthy in that this is the first time Nick Courtney and Nicola Bryant have worked together on camera.) This soap-style video with a streak of comedy, is exclusively available from MJTV, producers of the "Soldiers of Love" series. For more information, visit www.ghostlands.demon.co.uk. BF Welcomes Iris Wildthyme: Big Finish will debut a third series of Who-related merchandise in 2001, as announced on their website. Iris Wildthyme, the popular character featured in several BBC books written by author Paul Magrs, will feature in her own book and audio series from BF. Wildthyme, a fellow renegade Time Lord who has enjoyed a long-standing tryst with the Doctor (and has encountered him in several incarnations), will debut in a book written by Magrs, along with an audio play written by Stephen Cole. No casting or release date information has yet been posted. A New Beginning for the Benny Summerfield Adventures: Paul Cornell, who owns the rights to the character, advised on an anthology that kicks off the new publishing foray; all books and audios will now have the moniker "Professor Bernice Summerfield And..." before the name of each production. They will not be called New Adventures, however, as BF only has the rights to certain individual characters and not many of the other creations in the earlier Virgin book range. Says the new website: "And so, we now prepare to pick up the story of her life, and those around her, some time later- at the dawn of the twenty-seventh century in fact. Benny has now set up home on The Braxiatel Collection, a small planetoid that her old chum and fellow academic Irving Braxiatel has created to house what is, probably, the biggest and best collection of... well things that people with money collect, in the galaxy. Scholars, researchers and interested parties the cosmos over flock to The Braxiatel Collection to see the art, literature, history and science on display there. Or they will, when Irving gets around to actually finishing it." Meanwhile, a new series of Benny audio plays will be issued bi-monthly, alternating with the novels. These new stories will not be adaptations from Virgin Books. Paul Cornell may be editing a second anthology in 2001, with an open submissions policy. The new website for the releases is located at www.bernicesummerfield.com. The Squire's Crystal by Jacqueline Rayner (Novel): Release scheduled for April 2001. The Stone's Lament by Mike Tucker (Audio): Directed by Ed Salt; stars Lisa Bowerman with Harry Myers and James Lailey. Release scheduled for May 2001. The Extinction Event by Lance Parkin (Audio): Release scheduled for June 2001. The Infernal Nexus by Dave Stone (Novel): Release scheduled for July 2001. The Skymines of Karthos by David Bailey (Audio): Release scheduled for September 2001. Campaign: Jim Mortimore's now-canceled Doctor Who novel is available as a fan-published, bound volume direct from the author. The book, which was canceled by BBC Books due to contractual reasons, is available priced UK 5.99 (paperback) or UK 12.99 (hardback) plus UK 3.00 postage from Jim Mortimore, 27 Colston Rd, Easton, Bristol, BS5 6AA. "Add 5.00 P&P for overseas," says Mortimore, "and if it's any different I'll sort 'em out on an individual basis when I go to the post office." Says online rep John Parkinson: "If people aren't sure I'd suggest getting an NA and weighing it, then add a bit extra weight for packaging and use some method (I think the RoyalMail website has details) to work out how much it should cost to ship to the country of your choice." A thumbnail of the cover art is available on the Forthcoming Releases page. Further information on ordering this volume can be obtained directly from Jim Mortimore at jimmortimore@jimbo98.freeserve.co.uk (email address given with permission of Mr. Mortimore). Additionally, Ambrosia Books in California has this book in stock, signed by the author. I, Who 2 On Horizon: After the success of the first volume, author Lars Pearson has announced "I, Who 2," the sequel to the original "I, Who: The Unauthorized Guide to Doctor Who Novels". The reference work is expected sometime in 2001 and will include books published after the ones in the first volume, as well as additional adventures (such as "The Masters of Luxor," the unfilmed Hartnell story), the realm of DW comic adventures, and even covering some of the charity fiction anthologies of late. The Doctor's Effects: Author Steve Cambden's follow-up book to "The Doctor's Affect" is now complete and at the printers, and will be available in mid-2001. Says correspondent Richard Bignell: "Steve had hoped to make this a large format book, but he's had to scale this down somewhat, so it will now be the same size as his previous book, 'The Doctor's Affect' - only with more illustrations and photographs." To preorder the book, visit www.alphawaves.net/doctor/. Doctor Who Location Filming: Author Richard Bignell is currently finishing a licensed book on Doctor Who location filming for Reynolds & Hearn, which will be available by the end of 2001; details forthcoming. Looking for Sarah Jane Smith: Australian author David Franklin -- also a Doctor Who fan -- has penned his fourth novel, Looking for Sarah Jane Smith. It's "a brutally cynical comedy about three blokes in their late 20's, the scrapes they get into and the s**t they talk to each other. It is a long way from being politically correct." There is little Doctor Who content in the book, also the series is referred to routinely (and therefore is of interest to fans); "Sarah Jane is simply used by Marty as a symbol of the harmony, beauty and inner contentment that he is looking for." Missing Pieces: As noted in Doctor Who Magazine, "Missing Pieces" is a large-format Doctor Who fiction anthology, sold as a charity fundraiser equally divided for the Downs' Syndrome Association and the Foundation for the Study of Infant Death. Edited by Mark Phippen (creator & co-editor of "Perfect Timing") and Shaun Lyon (editor of Outpost Gallifrey), the book features an introduction by Peter Davison, an afterword by Sylvester McCoy and original fiction by Colin Bakerand Wendy Padbury. Over 30 professionally-published Dr. Who authors have participated in the collection, including Peter Anghelides, Trevor Baxendale, Arnold T. Blumberg, Colin Brake, Simon Bucher Jones, Jonathan Blum, Daniel Blythe, Stephen Cole, Martin Day, Keith R.A. DeCandido, Steve Emmerson, Craig Hinton, David J. Howe, Paul Leonard, Steve Lyons, Paul Magrs, David A. McIntee, Jon deBurgh Miller, Jonathan Morris, Jim Mortimore, Lance Parkin, Lars Pearson, John Peel, Gary Russell, Rob Shearman, Cavan Scott & Mark Wright, Dave Stone, Keith Topping, Mike Tucker and Nick Walters, as well as many prominent fan authors and illustrators. 380 pages, full color cover art by artist Nathan Skreslet, perfect bound. Ordering information is now available, visit http://www.gallifreyone.com/pieces.htm. The book was launched at the Gallifrey 2001 convention; the first group of 250 orders has been fulfilled, and the second batch is due in late April/early May. A third batch is planned for the summer. Lifedeath: Another anthology collection is being gathered to raise money for Amnesty International. Doctor Who: Lifedeath will feature contributions from fans as well as Doctor Who and comics authors. For more information, visitwww.geocities.com/lifedeathcharity. Myth Makers 10: An anthology of Who fan fiction distributed by the Doctor Who Information Network (DWIN) and edited by Matt Grady, "Myth Makers 10" features stories of the third, fourth, sixth, seventh and eighth Doctors, with companions Liz, the Brigadier, Peri, Ace and Sam. Includes illustrations by Fan Q award winner Mary-Ellen Sandahl and nominee Pat Degan. Visit http://www.csc.uvic.ca/~mgrady/drwho.html. Walking In Eternity: Author Jay Eales (co-editor of Perfect Timing 2) is putting together a new anthology. Says Eales: "It's a collection of Doctor Who stories with a difference. Fans of deeply traditional (and oh, so familiar) corridor runarounds are probably going to be disappointed with the mix of stories here. It will focus very much on the experimental side, taking the motto "Originality over continuity." One of the new authors is Steve Gallagher ("Warriors' Gate," quot;Terminus"), in his first Doctor Who piece in a long while. More information soon. Friends of Doctor Who Shuts Down, 800-TREKKER Sold: The US national fan organization Friends of Doctor Who (sanctioned by the BBC) has closed with the mailing of their final issue this month, as 800-TREKKER, the merchandise group that owns FDW, is being sold. All subscribers have received a note in the mail concerning the status of the group. Who3D: A new fan project designed to digitally recreate lost episodes of the show utilising CGI programming and surviving audio and photos. More information is available at the new web location at www.who3d.com. The group made screening debuts of its preliminary footage at the Whovention convention in Australia and the Gallifrey convention in Los Angeles during February. Regeneration Campaign: A new web-based campaign has been started to bring Doctor Who back to television. For more information visit www.regeneration-campaign.com. "The Making of Fury From the Deep" by Richard Bignell is currently available with the reconstruction of this classic story. The documentary contains all available color footage from the story (shot on small camera) as well as commentary by cast and crew Hugh David, Michael E. Briant, Margot Hayhoe, John Abineri and Roy Spencer, along with Peter Day (who worked on Visual Effects) and excerpts from "The Slide," author Victor Pemberton's 1966 radio play which was originally submitted to the DW production office in 1964 and which was eventually reworked into "Fury". The final duration of the documentary is 51 minutes and is circulated on telesnap reconstruction tapes with the story. BBC DVD Release Strategy Reexamined: Due to the amount of delays, due both to production as well as packaging, the BBC is reexamining its DVD release strategy for 2001. To that end, The Caves of Androzani has been pushed back from its April 2001 release date to June. In addition, the 1996 TV Movie, originally due in the summer (by early reports), will be released in the autumn. These releases are only currently in PAL format (for UK, Australia and New Zealand & compatible DVD players); NTSC format (US/Canada) are expected from BBC Worldwide in late 2001. Special thanks to Steve Roberts of the Restoration Team and our other correspondents for this information. The Five Doctors: Now in release in UK and Australia/New Zealand. This is the 'special edition' remastered originally for video release. Dual-layered with Dolby Digital soundtrack; the soundtrack was remixed using full multi-channel sound and the disc includes the full music soundtrack. Includes subtitles in six languages. Intended for US/Canada release in late 2001. Robots of Death: Now in release in UK. Includes a commentary by author Chris Boucher and producer Philip Hinchcliffe; 10 minutes of shots and model footage ("unused footage, ex-monochrome Shibaden tape"); an image stills gallery; production notes; and a floor plan from the production. Australia/New Zealand release delayed; scheduled for US/Canada release at the end of 2001. Spearhead from Space: Now in release in UK. Includes commentary by actors Nicholas Courtney and Caroline John. Musical cuts were made, including digital removal of a Fleetwood Mac track in part two and replacement of a Led Zeppelin track from the trailer for part three. Includes Kevin Davies' five-minute spoof "UNIT Recruitment Film"; a photo gallery with rare or previously unseen photos; two BBC trailers from the 1999 repeat season; a specially shot 35mm trailer for the 1999 Doctor Who night; and a bonus hidden feature (Easter Egg). Also included is the option to display production information via on-screen subtitles, which gives the viewer details of the locations used and other points of interest throughout the story. Remembrance of the Daleks: Now in release in UK. Includes commentary by actors Sylvester McCoy and Sophie Aldred; a four-minute extra including deleted scenes, bloopers and outtakes; two original BBC1 trailers (one of which was reconstructed specially for this disc); two multi-angle sequences featuring Ace's baseball attack on a Dalek and subsequent escape, and the gate explosion sequence; and an isolated music track provided by musician Keff McCulloch including a couple of unused music cues. Two pieces of music by the Beatles were removed digitally. An error in production has allowed a couple of small scenes to be released on the disc without requisite effects, using earlier takes for the scenes. Among them is a sequence in the scrapyard where a soldier is shot by a Dalek beam; the ray is not added to this version. The Restoration Team are hoping to correct this for future pressings including overseas releases, but cannot guarantee that any work will be able to be done to fix it. The Caves of Androzani: Release date moved to June 13, 2001. As the master tapes have seen some decay, the Restoration Team is busy doing some much-needed work for its DVD release. Director Graeme Harper has been liaising with the RT on some of the work, which includes remaking the planet surface matte shots in episode one to remove movement between the foreground and background elements. Harper, Peter Davison and Nicola Bryant recently taped commentary audio in the studio for the release. In addition, a number of special items will be included on the disc, including a BBC-1 trailer for part one (remade in broadcast quality); three news items including the announcement of Davison's departure on the One O'Clock News, a Kate Adie interview with Davison on the same day, and an interview with Davison and producer John Nathan-Turner from the following day's "Southeast at Six"; a photo gallery; and a subtitle 'text commentary'. Says Steve Roberts: "A 75-minute isolated camera recording from the last studio session exists (an 'iso' recording is generally designed to capture alternative angles that are not always being covered by the main cameras and provide additional shots for the director to use in post-production) and includes the shooting of the regeneration from Peter Davison into Colin Baker. An eight-minute featurette is being prepared which will include some of this material and will be accompanied by a commentary. An audio interview with the late Christopher Gable, who played Sharaz Jek in the story, has been loaned to us and forms the basis of a separate four minute featurette entitled 'Creating Sharaz Jek', which also includes previously unseen photographs from Gable's own collection, rehearsal and iso camera material from the last studio recording session, and extracts from the finished show." Musician Mark Ayres is working on the isolated soundtrack which will be presented in its entirety. Roberts also explains: "Nearly two hundred tape dropouts and scratches were repaired over the four episodes. Several technical errors in the original editing were spotted and corrected. The most noticeable of these were a one-frame zoom into the picture just prior to a cut near the end of episode three, which was corrected by repeating the previous frame, and a sideways hop halfway through a shot in episode two. The latter was quite tricky to fix, as the entire shot moved to the right halfway down one field and then stayed in this position for the rest of the shot. There is another occurrence of this in the same episode, but unfortunately it has the holographic communications screen superimposed over it, so it was impossible to fix the displacement of the background without affecting the superimposed foreground element." The 1996 TV Movie: Release scheduled for autumn 2001, likely August. This DVD will contain the complete, uncut print of the film as well as many extras including the Electronic Press Kit produced for the FOX network and television trailers (including a caption tribute to the late Jon Pertwee which was broadcast with the movie on BBC1 in 1996). Film producer Philip Segal (who spearheaded the 1996 film) taped a 10-minute interview with Steve Roberts at the Gallifrey 2001 convention, which will be included on the DVD release (an earlier announced introduction was not used). Among other comments, Segal notes some of the changes he'd have made if he had not been strongarmed by FOX, such as the romantic aspect and the "Americanisation" of the program. Additionally, director Geoffrey Sax has taped the first single-person commentary for a Doctor Who DVD release; according to the Restoration Team, he gave "great insight into the technical complexeties of making the show." Paul McGann was asked to do the commentary track but declined. Vengeance on Varos: Release scheduled for October 2001. Colin Baker, Nicola Bryant and Nabil Shaban (Sil) taped a commentary on March 29 for this release, which will (unlike previous releases) not include an isolated music soundtrack. "This was purely because the music was used so sparsely throughout the story that we felt it did not work in the synchronous-use form for which we held the rights," says the Restoration Team website, which also notes the reconstruction of a particular scene in episode one. "There is a technical fault with some shots of the gun used to torture Jason Connery. Inside the gun is a red light, which was too bright and caused an illegal video signal... To overcome this, a Philips VS4 noise reducer was put into a mode which severly blurs the video in both horizontal and vertical directions.... The uneveness was then removed by locking onto that particular shade of red using the Pogle secondary colour corrector and then turning the saturation up so that the red went into clipping and removed any level variations." A one-inch studio recording spool for the story still exists, which will be used as the basis for a small feature which shows a problem scene and how the director used multiple retakes to give him the shots he needed. Early 71 edits of both episodes exist on timecoded U-matic dubs (of the director's VHS copies) in Ian Levine's collection, which Ian has kindly loaned to the Restoration Team; these will provide a number of extended and deleted scenes for inclusion on the disc. The Tomb of the Cybermen: Due in January 2002. No further information available. Future Releases: BBC Video wants to run the gamut through all seven TV Doctors for DVD releases first. 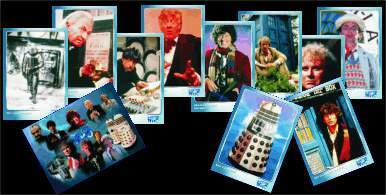 Releases of one Hartnell and one Troughton story are likely for 2002 along with more Tom Baker releases. One website, the Wolves of Fenric, reported that "Pyramids of Mars" and "The Ark in Space" might be on the schedule sometime soon, but both have been denied. Doctor Who Continues on Audio: Big Finish Productions is currently releasing monthly Doctor Who stories starring members of the series' original cast. The BBC has renewed Big Finish's current contract for an additional year, through 2002. A Second Season for McGann Confirmed: Big Finish Productions has confirmed that a second season of adventures with the Eighth Doctor and Charley, starring Paul McGann and India Fisher (right). McGann was recently in the studio taping six stories for release in January to June of 2002. There is also a linking story in the adventures: the first three "sees the Doctor and Charley attempting to get to New Year's Eve, 1930, to keep Charley's appointment with her gentleman friend Alex Grayle in Singapore the journey that led to her being aboard the R101 in the first place." More details on the forthcoming adventures below. Eleanor Bron, popular UK stage & screen actress who appeared twice previously in Doctor Who (in a cameo with John Cleese as an art lover in "City of Death" and more visibly as villainous Kara in "Revelation of the Daleks"), portrays Ileana de Santos in the forthcoming "Loups Garoux". Joining Bron is actor Burt Kwouk, the popular character actor best known for his role as Cato in the "Pink Panther" movies alongside Peter Sellers, and who has appeared in such films as "Empire of the Sun," "Rollerball" and "Goldfinger" as well as in the Doctor Who story "Four to Doomsday" as Lin Futu; and actor Nicky Henson, a versatile TV character actor in Britain. Actor Michael Sheard, who appeared in many Doctor Who stories including "Pyramids of Mars," "Remembrance of the Daleks" and "The Mind of Evil," is a confirmed guest for the forthcoming "The Stones of Venice" as Count Orsino. Lalla Ward again reprises her role as Romana in "NeverLand"; Anthony Keetch (Vansell) returns for a third go in the same story. "The Stones of Venice" (March 19, 2001): Written by Paul Magrs, directed by Gary Russell. Stars Paul McGann and India Fisher as the Eighth Doctor and Charley, with guest star Michael Sheard as Count Orsino. The Doctor and Charley become embroiled in the decadent court of a tired Duke and his search for his beloved wife. The curse of the long since dead Duchess has finally come to pass and the enchanted city of Venice is sinking beneath the canals. Also starring Nick Scovell (Churchwell), Barnaby Edwards (Pietro), Elaine Ives-Cameron (Ms. Lavish), Mark Gatiss (Vincenzo). "Minuet in Hell" (April 17, 2001): Written by Alan W. Lear and Gary Russell, directed by Nicholas Briggs. Stars Paul McGann and India Fisher as the Eighth Doctor and Charley, with special guest star Nicholas Courtney as Brigadier Lethbridge-Stewart. The twenty-first century has just begun, and the newly-formed state of Malebolgia is seceding from the rest of the United States of America. After his successful involvement with Scotland's devolution, Brigadier Alistair Gordon Lethbridge-Stewart has been invited over to Malebolgia to offer some expertise. However, there's someone held in a lunatic asylum who interests him, someone who believes he travels through space and time in the TARDIS. It is not, however, his old friend the Doctor... Also stars Robert Jezek (Brigham Elisha Dashwood), Helen Goldwyn (Becky Lee), Maureen Oakeley (Dr. Dale Pargeter) and Nicholas Briggs (Gideon Crane). Dalek Empire I: Invasion of the Daleks (June 4, 2001): Written and directed by Nicholas Briggs. The largest Dalek fleet ever assembled begins its invasion of the galaxy, heading straight for the Vega System. On planet Vega VI, Suz and Alby take their first, delicate steps towards romance, whiling away a lazy afternoon on the Marsh Lakes. But the Dalek onslaught is already under way. Who is the mysterious stranger Suz finds amongst the devastated remains of Vega VI? What is Alby's secret? Can the Daleks' relentless advance across the galaxy ever be stopped? "Bloodtide" (June 18, 2001): Written by Jonathan Morris, directed by Gary Russell. Stars Colin Baker and Maggie Stables as the Sixth Doctor and Evelyn. "The prehistoric Earth is dying. Thunderclouds roll across the skies, cloaking the land in darkness. The seas crash and boil as the rain turns to acid. The remnants of the Silurian race place themselves in suspended animation, deep below the surface. One day they will awaken and reclaim their world... The TARDIS has landed on the Galapagos Islands, a desolate outcrop of rocks shrouded in mist and fear. In the settlement of Baquerizo Moreno, there are rumours that prisoners have been mysteriously disappearing from the gaolhouse. A fisherman has been driven insane by something he saw in the caves. And the Doctor and Evelyn are not the only new arrivals; there is also a young natural philosopher by the name of Charles Darwin..." Also stars Miles Richardson (Darwin), George Telfer (Captain Fitzroy), Julian Harries (Governor Lawson), Daniel Hogarth (S'Rel Tullock), Helen Goldwyn (Shevak) and Janie Goddard (Greta). Features the Sixth Doctor and Evelyn with the return of the Silurians from the television series, and... Charles Darwin! Music by Alistair Lock. "Dust Breeding" (July 23, 2001): Written by Mike Tucker, directed by Gary Russell. Stars Sylvester McCoy and Sophie Aldred as the Seventh Doctor and Ace. "On nineteenth Century Earth artist Edvard Munch hears an infinite scream pass through nature. Centuries later his painting of that Scream hangs in a gallery on the barren dust world Duchamp 331. Why is there a colony of artists on a planet that is little more than a glorified garage? What is the event that the passengers of the huge, opulent pleasure cruiser 'Gallery' are hoping to see? And what is hidden in the crates that litter the cargo hold? The Doctor's diary indicates that the painting is about to be destroyed in 'mysterious circumstances', and when he and Ace arrive on Duchamp 331, those circumstances are well underway. "Originally this slot was filled by a story called "Dark Rising" though we are told by Big Finish that Tucker was dissatisfied with his own progress on the script, and so he submitted a completely different story that Big Finish accepted. "Project Twilight" (August 20, 2001): Written by Cavan Scott & Mark Wright, directed by Gary Russell. Features the Sixth Doctor and Evelyn, and is a vampire story set in modern day London. Says DWM: "a gritty tale of vampirism in modern-day London, the story promises gore, gambling and garlic galore." "The Eye of the Scorpion" (September 17, 2001): Written by new author Iain McLaughlin. A Fifth Doctor & Peri pseudo-historical romp through ancient Egypt. Dalek Empire III: Death to the Daleks (October 3, 2001): Written and directed by Nicholas Briggs. Suz decides it is time to take control of events. But when she is summoned to an audience with the Dalek Emperor, she begins to fear that all her efforts have been in vain. Meanwhile, Earth Alliance Security commander-in-chief Tanlee is intent on locating Alby. The Dalek advance across the galaxy seems unstoppable and the only possibility of salvation for the human race lies in the Lopra System. But how can Alby help, when no one will tell him the purpose of 'Project Infinity'? "Colditz" (October 22, 2001): Written by Steve Lyons. A Seventh Doctor and Ace story set in Colditz, Germany. Dalek Empire IV: Project Infinity (December 3, 2001): Written and directed by Nicholas Briggs. The Seers of Yaldos have a sad story to tell, but Alby and Kalendorf know they must listen. Meanwhile, the Daleks seem unconcerned by their recent defeats. They have their sights firmly fixed on Project Infinity. In the hands of the Daleks, the human race's only hope of victory could signal the destruction of the entire universe. "Invaders From Mars" (January 2002): Written and directed by Mark Gatiss. The second 'season' of Eighth Doctor & Charley adventures starring Paul McGann and India Fisher begins. "The TARDIS misses the date by a few years and miles, arriving instead in New York, 1938. While the Doctor assumes the guise of a local gumshoe and helps out a dame searching for her missing uncle, Charley is kidnapped by hoodlums trying to break into another gangster's 'patch'. Meanwhile, in the studios of CBS Radio, Orson Welles is transmitting his ground-breaking War of the Worlds radio drama, blissfully unaware that New York has indeed been visited by aliens..." Also stars Ian Hallard (Mouse), Mark Benton (Ellis), Jonathan Rigby (John Houseman), David Benson (Orson Welles), Paul Putner (Bix Biro), Simon Pegg (Don Chaney), Jessica Stevenson (Glory Bee) and John Arthur (Cosmo Devine). "The Chimes of Midnight" (February 2002): Written by Rob Shearman, directed by Barnaby Edwards. "Still unable to reach 1930, the TARDIS places the Doctor and Charley into a Victorian household, in 1906. There they meet the servants of Edward Grove who seems to keep his workers in a constant state of bewilderment and terror. When the scullery maid is found murdered, it falls to the famous amateur sleuth known as the Doctor to solve the mysteries. The only trouble is, the household keep shifting into different moments in time." Also stars Louise Rolfe (Edith), Lennox Greaves (Mr. Shaughnessy), Sue Wallace (Mrs. Baddeley), Robert Curbishley (Frederick) and Juliet Warner (Mary). "Seasons of Fear" (March 2002): Written by Paul Cornell and Caroline Symcox, directed by Gary Russell. "The TARDIS finally gets Charley to Singapore in time for the festivities. However, while she enjoys her young man's company, his Grandfather, Sebastian Grayle, taunts the Doctor. Apparently, they are old and bitter enemies and Grayle has finally succeeded in killing the Doctor. With time running out, the Doctor and Charley must embark on a journey through history to discover how Grayle received the 'gift' of immortality and just how he has managed to destroy the Time Lord..." Also stars Stephen Perring (Sebastian Grayle), Stephen Fewell (Marcus and Richard Martin), Robert Curbishley (Lucillius), Lennox Greaves (Edward the Confessor), Sue Wallace (Edith), Justine Mitchell (Lucy Martin). "Embrace the Darkness" (April 2002): Written and directed by Nicholas Briggs. "The Doctor and Charley travel to the remote Cimmerian System to unravel the mystery of its sun. But darkness has already embraced the scientific base on Cimmeria IV in more ways than one. In a fight for survival, the Doctor must use all his wits against a deadly artificial life-form and an ancient race whose return to the Cimmerian System threatens suffering and death on an apocalyptic scale." Also stars Nicola Boyce (Orllensa), Lee Moone (Ferras), Mark McDonnell (Haliard) and Ian Brooker (ROSM). "The Time of the Daleks" (May 2002): Written by Justin Richards, directed by Nicholas Briggs. "The Daleks are back and face the Eighth Doctor for the first time. As the Dalek Empire continues to spread through the galaxies, they seek, once again, to conquer the fourth dimension and travel back to the post-apocalyptic twenty-first century Earth to find a particular leader who can aid them in their quest. To the Doctor, their time device is crude and unworkable. And yet it does lead him to wonder if the Daleks know more than they are letting everyone else believe." Also stars Learman Dot Smith (General Mariah), Nicola Boyce (Viola), Julian Harries (Major Ferdinand), Jem Bassett (Kitchen Boy), Mark McDonnell (Priestly), Lee Moone (Hart), Ian Brooker (Professor Osric) and Nicholas Briggs & Alistair Lock (Dalek Voices). "NeverLand" (June 2002): Written by Alan Barnes, directed by Gary Russell, featuring special guest star Lalla Ward as President Romana. "Why are the Time Lords so keen to track the Doctor down? Exactly what lengths will the Celestial Intervention Agency go to in their efforts to retrieve something important from within his TARDIS? Who is the mythological destroyer Zagreus? And what has caused Imperiatrix Romanadvoratrelundar to declare war on the rest of creation? The Doctor seeks the answers deep within an entirely new universe and must face up to the actions not only of himself but the hundreds and thousands of Time Lords who have gone before. NeverLand is set to end this run of adventures for the Eighth Doctor on an explosive high and it is true to say that nothing will ever be the same again!" Also stars Anthony Keetch (Vansell), Peter Trapani (Kurst), Holly King (Levith), Lee Moone (Under-Cardinal), Mark McDonnell (Rorvan), Nicola Boyce (Taris) and Dot Smith, Jonathan Rigby and Ian Hallard (Matrix Voices). Big Finish Audio Online Ordering: Big Finish has opened its online store, allowing secure ordering from its website. Big Finish's website can be found at http://www.doctorwho.co.uk.